For five years, thousands of youth were besieged by Assad Regime. Left without access to proper education, with lack of access to internet and electricity. One of the many inspiring things that the dictator could not steal from them is their ability to dream for a better future. 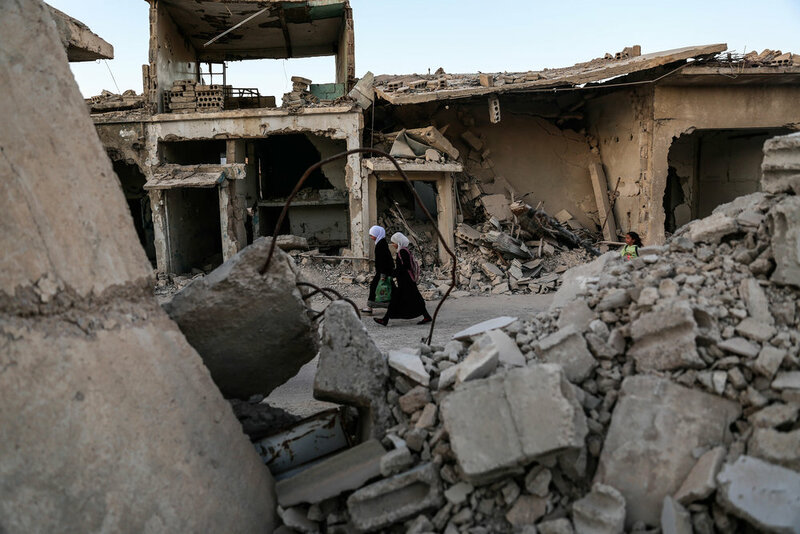 Children pass by destroyed buildings as they walk along a damaged street while they are going to their school. A child poses for a picture at a kindergarten in the city of Douma. A picture shows a damaged classroom following an airstrike by the Syrian government forces on the city of Douma. A man irrigates plants inside a greenhouse that made as an alternative due to the lack of farming lands. A man harvests wheat in a field near the town of Hamouria. A boy pushes a water-pump in the city of Douma. Abu Ali al-Bitar, a 45-year-old house painter who collected dozens of rocket debris and spent ammunition casings, flattens bread dough using a leftover rocket in the city of Douma. A picture shows bread made of animals' fodder during the most difficult period of the siege that enforced by the Syrian government on Eastern Ghouta. A Syrian Arab Red Crescent lorry is seen parked in the city of Douma. During the hardest period of siege a few convoys entered Eastern Ghouta after more than 10 months of the intensified siege and the aid do not cover the need of 10% ؜ of the population of Ghouta for a week. A man bakes a bread at his damaged bakery in the city of Douma. A man shepherds the sheep in the destroyed neighborhood of Jobar. Youth playing soccer in their destroyed school in the city of Douma. A picture shows a general view of damaged buildings in the city of Douma, east of the capital Damascus as a sandstorm blows over the city. Kidney specialist Mohamed Sadeq, a 34-year-old Syrian physician, attends to his patient, who suffers from renal insufficiency, as he undergoes treatment in the basement-turned-clinic in the city of Douma. A close up shot shows the hand of a Syrian patient as he undergoes treatment in the basement-turned-clinic. A close up shot shows medical equipment used for treatment in the basement-turned-clinic. A picture shows a damaged dialysis machine inside a basement-turned-clinic in the city of Douma. A picture shows the missing injections that patients used to receieve. Beekeepers work on hives at a bee farm in the town of Hamouria, in the eastern Ghouta region on the outskirts of the capital Damascus. A beekeeper applies smoke through a smoker to facilitate inspecting hives at a bee farm in the town of Hamouria. A beekeeper carries hives at a bee farm in the town of Hamouria, in Eastern Ghouta. Apart from being a natural source of energy honey is used as a homoeopathic treatment for burns and wounds. A man buys groceries from a shop at night in the city of Douma. A man rides his bicycle past a man selling grains during a halt in fighting on February 29, 2016 in city of Douma, in Eastern Ghouta. People stand next to a stall to sell grains in the city of Douma. A man and child sit together and have a meal in a makeshift stall at night, in the city of Douma. A picture shows the lights of makeshift stalls at night in the city of Douma. A general view shows the damaged buildings at night in the city of Douma, as the Syrian government deprived people there from the electricity for more than 5 years. A man cleans the solar chargers those people started using as an alternative to acquiring electricity power in the Syrian city of Douma. People put solar chargers instead of the damaged window in the Syrian city of Douma. The solar chargers are seen on the top of a destroyed building in the city of Douma. Abu Fahed, burns rubber tires with an incinerator, to produce fuel and gas from plastic waste materials. A picture shows bags filled with gas that extracted from plastic materials at a workshop in the besieged city of Douma. A worker rolls the rubber tire to take it to the incinerator. Abu Fahed, poses for a picture at a workshop produces fuel and gas from plastic in the city of Douma. A man cuts down a tree for firewood used for heating and cooking. A man cuts a tree for firewood used for heating and cooking. 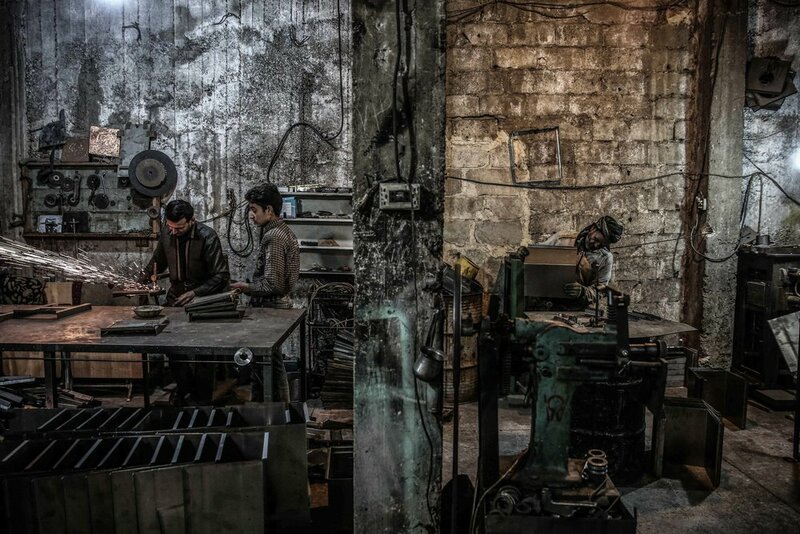 People work at a factory producing wood-burning stoves, known locally as a "sobia", in the city of Douma. As the weather in Douma is getting colder, wood is the most affordable source of heating for residents. A man works at a factory producing wood-burning stoves, known locally as a "sobia", in the city of Douma. People work at a factory making wood-burning stoves in the city of Douma.